This summer I was lucky to work in the lab of Dr Victoria Cowling, where I explored the relationship between proteins essential for the transcription of mRNA. Dr Cowling delivered a guest lecture during the first semester of my second year and I found the topic of her research interesting and engaging. When I discovered later that I could spend my summer in a lab and have hands on experience with practical work and theoretical investigation, I decided to try my luck and apply. I wanted to get a feel of what working in a real research laboratory would be like with a group of people who live and breathe science, and wanted to see whether I would, in the future, also want to work in such an environment. Over the course of my internship I had a chance not only to learn new experimental techniques and learn about a topic that had major implications to the underlying mechanism of gene expression but also explore a variety of other areas of science via seminars and talks. In Dr Cowling’s lab I was shown how to isolate proteins, work with tissues and HeLa cells and how to optimize experiments. It is difficult to deal with a lack of results, failing or with difficult to organise experiments but I found that it is important to consider what could have gone wrong and how to correct it. Also I found that it is never a bad moment to ask for guidance, engage in discussion with other lab members or question results. It is important to be able to plan your own experiment and adjust various components to make it work. Being a part of the GRE Summer School, leading scientists in the Gene Regulation and Expression unit presented their resent research and gave us a glimpse to what we could expect to see in Dundee’s scientific future. I believe that a vacation scholarship is one of the best ways to spend your summer if you are thinking of a further studies or a career in academia. Not only will it allow you to accumulate valuable work experience but also allow you to learn about the dynamics or a research lab group and understand for yourself whether this is the right path for you. It is an adventure on its own and will challenge not only your intelligence but also patience. Part-taking in this was an amazing opportunity for me and I would do it again. As I enter my final year of my Microbiology degree I saw this as a great opportunity which would allow me to enhance my existing skills/knowledge that I am currently learning at university. After enjoying laboratory projects taken during term time, I decided to apply for lab work during the summer in the Division of Plant Sciences as I am interested in Plant Pathology. It was through the JB Studentship Prize that I was then matched to Professor Paul Birch’s Lab at the James Hutton Institute where I spent a 10 week placement helping out various members of the research group with a large variety of experiments. I feel this placement has given me invaluable lab experience and enabled me to learn first-hand from lab research staff working on projects/experiments. During my time in the lab I learned many new skills and carried out new protocols and techniques which allowed me to see how hypotheses go from a concept to proven fact. The placement also allowed me to improve skills I had previously learned through practical classes at University whilst allowing me to gain wider knowledge of the background science to reinforce the practical skills. The opportunity to work in the lab has enabled me to build my confidence in many areas, including practical mathematical applications when determining dilutions and concentrations. Whilst I experienced some experiment failures, this taught me to be confident enough to continue and carry out protocols unaided; showing me that science doesn’t always work first time, but to keep striving for positive progress when conducting repeats. I would recommend a summer placement to any undergraduate student that is considering one. These placements give students invaluable time and experience with experts in their field. It gives a realistic insight into the daily workings of a research lab and it gives the student practical experience to put hand-in-hand with knowledge gained from their University course. I wanted to undertake a vacation scholarship in order to fully experience what research is like beyond the classes at university, to develop new and existing lab and research skills, and to gain the invaluable experience that is becoming increasingly expected by employers. I spent my 10 week placement in Dr Davide Bulgarelli’s lab of the University of Dundee Division of Plant Sciences based at the James Hutton Institute, exploring the interactions between soil microbes and barley plants. I undertook voluntary work experience last summer in the same lab, so it was very interesting to come back and see how the research has progressed in a year, and follow on from last year’s work. Working in a research lab allows you to expand on what you have learnt through lectures and teaching labs. I was able to apply the skills and theory I had learnt at University to the scholarship, but I have also learnt about new, useful lab skills and techniques that will stand me in good stead for future projects. I have experienced what it’s like to work day to day as part of an established research team and got to know people who share the same enthusiasm I have for science. I worked particularly closely with Dr Bulgarelli and Rodrigo Alegria Terrazas, a PhD student currently working in the group, and I felt that, although I was an intern student, I was really an active and involved member of the team who was able to contribute my own ideas. The placement has also allowed me to improve my time management and independent work, which has improved my confidence in my abilities. My presentation skills were also tested and improved as I gave a summary presentation of my work this year to my small group to round off my scholarship. I also had the chance to be exposed to research conducted by other members of the Division of Plant Sciences and a wilder, international, scientific community through seminars and talks. This exposure gave me an insight into other areas of expertise other than my own, thus broadening my scientific knowledge and interests even further. I would absolutely encourage anyone who is considering a research career in life sciences to apply and gain experience with a summer placement. The whole experience has given me a valuable insight into the world of scientific research, and allowed me to build on and improve skills that will benefit me going forward at university and beyond. I have thoroughly enjoyed the experience and would definitely recommend it. I applied for a vacation scholarship at the University of Dundee as I was unsure whether a career in life science research was for me. I felt it was necessary to gain practical experience throughout my undergraduate degree to help me with this decision. I was placed in Prof. Angus Lamond's lab for 10 weeks over summer 2015, under the supervision of Dr. Mark Larance. My project focussed on how starvation can regulate K63-linked ubiquitination in mouse liver tissue, using mainly Western blotting and mass spectrometry. Although the first couple of weeks were a steep learning curve, I soon settled in, getting to know my way around the lab. I learnt a variety of invaluable techniques, which I know I will put to use for the rest of my degree, particularly in my final year project. I also feel my confidence in the lab greatly increased over the 10 weeks and this was largely down to supportive and helpful staff. I really enjoyed my experience in the lab and it has given me great insight into working in an active research environment. I would thoroughly recommend a summer placement to any undergraduate who is looking to develop their skills and gain crucial lab experience. The School of Life Sciences has been remarkably successful and fruitful in contributing to the scientific community, be it within Scotland or internationally. I have always been interested in pursuing a career in research and I thought the best way to go about this was to undertake an internship which would not only provide a realistic environment for such scope and possibly, provide a sensible direction and guide the research interest that I would want to pursue in the future. Application to the James Black Vacation scheme was more than a sensible one, as it would not only provide a realistic environment for deep learning but also possibly provide future directions for myself to pursue for higher education. The placement has allowed me to gain first-hand experience of what the life of a scientist would entail. From improving technical proficiencies to understanding the scientific rationales of many experiments, it has certainly reinforced my decision in pursuing research as a career. I have also been encouraged to attend seminars hosted within the School which have certainly benefited. The exposure to renowned academics through these talks have undeniably strengthened my resolution in following in their footsteps, as much remains to be discovered. I would definitely recommend undergraduate students to pursue a summer placement as this not only serves as an effective way to understand the going-ons within an active research laboratory but may also help provide possible research interests if unsure. I wanted to make sure that I made the most of my time at university, and decided the opportunity to do a summer studentship was not to be missed. I felt that applying for a vacation scholarship would be a great way to gain a new set of skills, and to see if life in the lab was for me. I spent my ten week placement with Gordon Simpson in his lab at the James Hutton Institute, at the forefront of plant science. Through my time in the lab I was taught many new techniques, and learned how they are used to make new discoveries. I was also able to see how the skills I learned in my practical classes were used in functional research labs. This has increased my confidence for lab classes and my future practical projects. The day to day experiences of the lab and office improved my ability to plan my work, ensuring experiments and write ups were done on time. I had to present this work at weekly meetings which was good motivation to make progress! I also had the opportunity to present a recently published paper to the rest of my team- good practice for public speaking and literature analysis, and allowed me to ask questions about aspects I wasn't sure about. Being surrounded by knowledgeable people on a daily basis made me feel more confident in what I had learned in the previous two years of university. Although I was only there for ten weeks, I was still able to experience the frustration of a failed experiment, and the happiness at progressing onto the next step. My role gave me the chance to speak to many people at different points in their scientific career- from principal investigators, post-doctoral researchers, to early and nearly completed PhD students. I also met people who work in research supporting roles such as health and safety management and scientific sales. This gave me a great deal of insight into what possible careers are available to me when I complete my degree. I have already encouraged many of my friends to apply for a studentship next summer, and I would recommend the experience to any life sciences student. It will let you see how a research lab really functions, and all of the negatives and positives associated with it. It will also help you to determine what topics really interest you, which modules to study, and what you would like to do after graduation. I am very glad I chose to apply, and grateful for being selected to participate. A major factor contributing to my initial application to the University of Dundee is the presence of an environment where active research and education are interrelated. Having undertaken two summer placements in the School of Research has contributed significantly to developing my experience and a sense of academic maturity. Primarily, these placements provide a great opportunity for any student to gain an insight into scientific research. However, it also allows one to enhance other key attributes which will be essential in their future career. Undertaking a placement, you will be working on an unanswered or unexplored question, thus making accuracy, knowledge of the topic and techniques important factors. Being in the situation of applying techniques to a relevant research question will help you to thoroughly understand the concepts - often you are becoming familiar with research areas you have not heard of before. Furthermore, you can attend talks, given by active researchers, which help expand your understanding across a broad range of topics. This has helped me to decide which direction I would like to pursue in my academic career. Therefore, the experience you gain will be very beneficial for the following years and beyond. Overall it was great fun! Spending time in a new environment with many interesting individuals, who are passionate about science and enjoy sharing their wisdom, is a unique privilege you will otherwise not encounter. I had the pleasure of joining Alessio Ciulli’s lab over the summer where I worked on the characterisation and modulation of protein-protein interactions using different biophysical methods. Being in a research laboratory for the first time was quite different from the previous lab experience I’d gained in teaching laboratories. Although the learning curve was initially steep I am certain that the time spent working in an active research lab will be most beneficial to my future studies and final-year project. Not only did the experience of a lab-based placement help me to determine which subject area to focus on as I continue my studies, I also learnt to appreciate that the difference between theory and application can be huge. For example, methods that are briefly described in a textbook can take several weeks to complete in practice, and even if the underlying theory sounds simple, applying that theory in the lab and interpreting an outcome can be a complex process. Developing experiments that target a specific question, and the interpretation of results gained are critical steps that students should learn as early in their career as possible. This studentship has encouraged me to set-up the young researchers association, a student run society with the goal of educating its members on scientific research and in bridging the gap between student-led and academic research. I am grateful for having received the opportunity to spend my summer in a research laboratory, and would recommend anyone to apply. I wanted to undertake a vacation scholarship because I was a little unsure whether a career in research science was right for me. Given Dundee's reputation for excellence in the Life Sciences I felt it would be the perfect place to gain some insight into what scientific research entails. My ten week placement was absolutely fantastic and confirmed that research science was what I wanted to pursue upon graduating. The lab techniques and knowledge I gained were absolutely invaluable and assisted me greatly in my final year research project; and will no doubt continue to aid me in later life. I would thoroughly recommend a summer vacation scholarship to anyone who wishes to learn more about scientific research and/or gain some crucial experience in preparation of their final year studies. 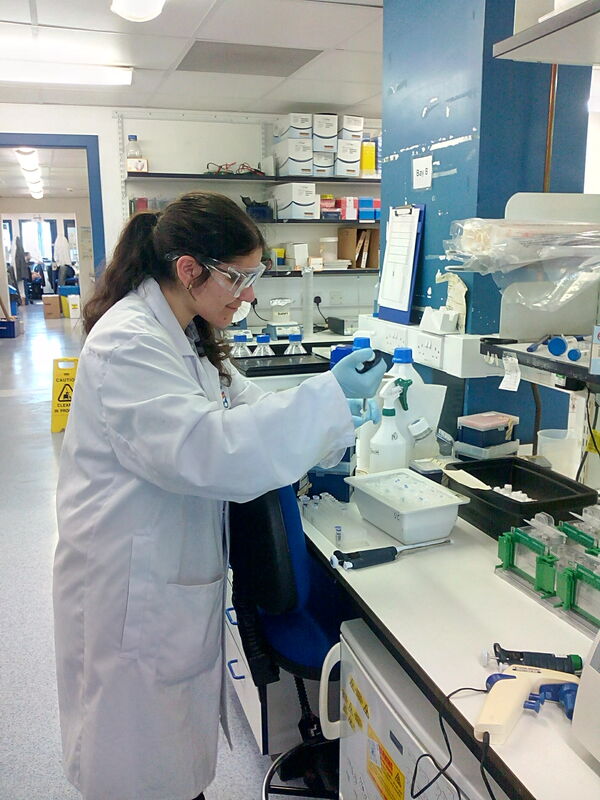 I applied for the summer scholarship programme as I felt it was an excellent way for me to build my skills up as an undergraduate and learn how a fully functioning research lab works from day to day. I felt that it was also a really good opportunity for me to try and develop skills that I would require heading in to my 4th year honours project, such as experimental design, time planning and general lab based skills. Being able to put the 10 weeks of experience in a lab was also never going to harm the CV for the future either. This was also a good chance to see if I really wanted to work in this environment after graduation. From the summer project I learned a lot, I learned how much hard work and time goes in to keeping research flowing in a lab is and how you have to manage your own time and experiments around equipment and other people. I learned lots of skills as well, specifically around plant sciences that I had never been exposed to previously and overall the experience has developed my confidence as an individual to go in to a lab and work independently and still provide results. I really enjoyed the whole experience even if things did not always work out as planned but being able to put in hard work and set up and run investigations that yield results that no one has ever tested before is a really good feeling. I also enjoyed meeting other people involved in research and gaining skills and experience from other members of the lab group. The lab group was also very helpful and made me feel really welcome which helped and allowed my confidence to build. I would certainly recommend this programme to any student it’s a great way to learn new skills, develop yourself as an independent worker in a lab. It is also a fantastic way to get meet other people working in areas you are interested in and find out about their experiences and pick up skills they know. I undertook a summer studentship within the Division of Cell and Developmental Biology at the University of Dundee during the summer of 2011. I assisted on a project aiming to observe and document the mRNA expression of notch signalling components during early embryonic development in the chick and mouse embryo, under the watchful eyes of Dr Shona Gray and Dr Kim Dale. I applied to the position as an alternative to typical summer employment, hoping to expand my practical skills in addition to those I had already gained through the previous three years of my undergraduate honours degree in Anatomical Sciences and to experience first-hand work within a university research laboratory. The experience I had within the division was above and beyond my expectations. Despite initially only being recruited to undertake results analysis, I was fortunate enough to have supervisors who were keen to expose me to every stage of the process. From my initial role in photographing and cataloguing the final preparations, I became involved in embryo harvest and dissection, preparation of labelling probes, in-situ hybridisation, cryostat sectioning and finally mounting the prepared specimens. I was additionally allowed to attend internal journal club meetings, which gave me an insight into the wider field of developmental biology, increasing my interest in the discipline as a whole. My summer studentship was one of the best experiences I have had at university. I loved the team mentality of working within the lab, and I am vastly grateful for the support and inspiration I received from my colleagues and supervisors – allowing and encouraging me to confidently try every lab technique I could and to gain the most from my time there. Although spaces are competitive, I would definitely recommend applying to any life science student. I never thought I would be lucky enough to be accepted, but I was and it was an experience so fantastic and rewarding that given the opportunity again it would take it up instantly. I did a vacation scholarship in Nicola Stanley Walls lab in 2012. I decided to do this to gain much needed laboratory experience, to help improve my practical skills as well as to experience what working in a research laboratory would be like. My project allowed me to carry out a variety of experimental techniques which greatly improved not only my technical skills but also my time management skills as I learned how to plan my daily activities and how to organise carrying out many experiments concurrently. I was also given the opportunity to present my work at monthly lab meetings which was extremely useful for gaining experience in presenting scientific research, a skill that will be important not only for my honours project but also for any career in science. Everyone in the lab was extremely helpful and supportive which really boosted my confidence in my ability to carry out scientific research. Overall I would say my project gave me a real insight into the workings of a research environment, allowed me to gain many new skills and thoroughly prepared me for my honours project. I would highly recommend it to anyone!